Single parent of an ADHD child, looking for a small bit of assistance. ADHD kids are met with daily behavioral and social challenges. Yet, extracurricular activities are known to be an awesome benefit for ADHD kids, to help them relate better and manage their thoughts and feelings better. I would like to enroll my child in an ADHD summer (8 weeks) camp for 2019, but the cost of tuition is $4000 with a $400 registration deposit. The camp information can be found here www.curryingram.org. My car stopped working last month due to a failed water pump, which will cost me $1600 to repair plus the labor. I don't want to disappoint my child. 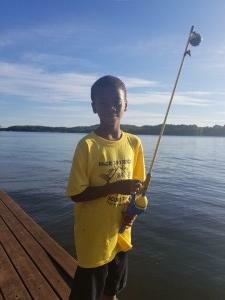 He needs this program since he was just diagnosed in May 2018 with ADHD. I am unable to do both...get my car repaired and enroll him and pay the tuition. Registration has just opened up for the camp and I truly do not want him to miss this awesome opportunity. If there are any 'Villagers' out there willing to help...thank you, it is appreciated. Looking for $4400 to fund ADHD camp expenses for my child. My son is a busy and curious eight-year-old with a few challenges. He needs the tools: to help him control himself better, understand his feelings, and communicate more effectively. The ADHD camp can provide those needed tools. Stacey is an awesome mother and great provider for her family. Her borrowed motto that her kids know so well is , Nothing will work unless you do by the great Maya Angelou. This statement is her anthem. Nothing stops her, she always makes a way.